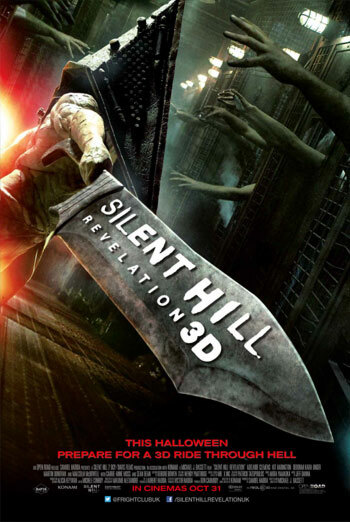 SILENT HILL - REVELATION is a US horror sequel about a young woman with connections to a demonic underworld. Moments of strong violence include a scene in which the heroine enters the kitchen of a restaurant to find a cook carving lumps of flesh out of a living human hanging from the ceiling, with clear sight of the man's internal organs accompanied by screams of pain. Other notable moments include sight of arms being cut off, bodies being impaled with swords, and decapitations. The film also contains infrequent strong language ('f**k').